8633, Lieutenant Colonel, Commanding 1st Battalion, Suffolk Regiment. Was awarded two campaign medals while with the 2nd battalion, Suffolk Regiment during The First World War. Died at sea 23rd May 1940 age 46. Buried in St. Mary’s graveyard, Leigh. Born in Leigh. Eldest of two sons of Frank and Constance Fraser. Dr. Frank Fraser was the Leigh General Practitioner. 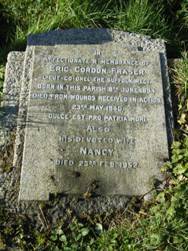 Eric Gordon was the husband of Nance Fraser, of Winchmore Hill, Middlesex. Born in this parish 8th June 1894. Died from wounds received in action 23rd May 1940. ‘Dulce Est Pro Patria Mori’.